Scams against seniors are all too commonplace. Seniors are often targeted for this type of crime because they are thought to be wealthy (although many aren't), or because they may be trusting because they are often lonely. Smooth talking telemarketers can coax seniors to provide their credit card, checking account, or debit card numbers and take the money and run before the senior is even aware anything has happened. Unfortunately, scams against seniors are difficult to prosecute. Seniors may be embarrassed that they have been taken and will simply want to keep it a secret. In addition, there may be little evidence to prove that the scam has actually been perpetrated. It becomes a case of the scammer's word against the senior citizen's in most cases, and there is often little proof that a crime has occurred. It is common for telemarketers to call seniors and say, "You've won a prize! ", and then to ask for bank account, credit card, Social Security, or other personal numbers in order for the seniors to gain delivery of the prize. 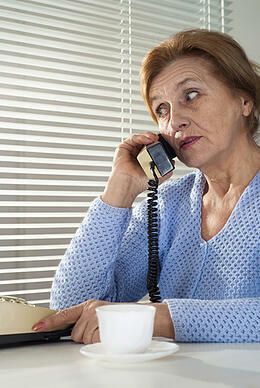 This is a favorite among scams against seniors because telemarketers think that seniors are sitting on a lot of cash. Whether or not that is true, seniors are told that there is a "no risk," high profit investment/deal that the senior has been specially chosen to take advantage of. Smooth talking telemarketers capture seniors' money by telling them they must act NOW. If they don't, they'll miss out on this great opportunity, great investment deal, free prize, etc. Everyone likes a free prize, and telemarketers know that. However, seniors can be gullible because they may automatically simply assume that everybody can be trusted. If they are told they must pay fees or hand over credit card or other personal information numbers in order to claim the prize, they will often do so. Telemarketers who perpetuate scams against seniors will not provide a legitimate address, business name, or other verifiable information about themselves. Again, scams against seniors are fly-by-night operations that often do not have any physical address or other contact information, just a P.O. box to receive mail. Seniors should never, ever give out personal information, including Social Security Numbers, credit card numbers, or financial account numbers over the phone. Legitimate businesses will almost never ask for personal information over the phone. Beware of "too good to be true"
There is generally no such thing as a high-profit investment that has no risk, nor a "free prize" out of the blue. If legitimate, the company in question will not ask for personal information over the phone. It is almost always true that a good deal will be around long enough that seniors can check it out. If the person is not sure about it, they can ask the telemarketer to hang up and call back later so that they can do some research. Any legitimate business will be happy to oblige; if the telemarketer refuses, hang up. Scams against seniors are all too commonplace, but they don't have to be. These crimes are hard to prosecute, but seniors can be made aware of them so that they don't fall victim.